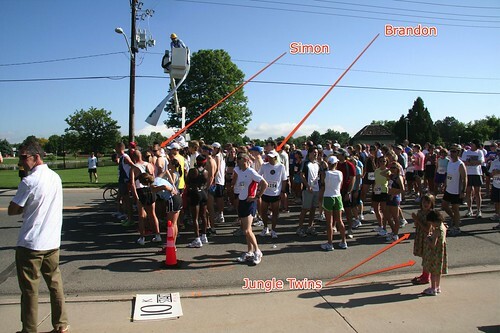 I ran my first Stampede in 2006. Last year, I did the 2 mile version with Sydney. This year, I hadn’t planned to run it. Been trying to stick to the one race a month deal. However, with that injury, I felt like I lost fitness and needed to jump start myself a bit. So when Simon emailed me early in the week and said he was coming up for it, that was enough. I handed over my $10 and signed up. Seriously, $10. Up the cost, people! I took the day before the race off. That was the extent of my taper. I didn’t have big goals for the race other than a PR and a good workout. I figured the PR was inevitable given I hadn’t run a 10k since Nov 2007. So many 10k races but just not a distance that I do often. The miles are easy. Guess I just don’t like the effort. Don’t like the 5k either. It is that “run as fast as you think you can but don’t cramp” pace. Oh well. Time to start! Love the small races. Line up at the front. No big deal. I had told Simon it was relatively flat but forgot about those random hills in the neighborhoods. Plus, this is the most turn turn turn turn course ever so I don’t think it is particularly fast. I tried to hold 7:0X most of the time. Found myself in the mid-6s on various downhills and nearly at 8:00 on a few climbs. I always passed a whole pack of people on uphills. Loved that. I obviously faded a bit in the middle. Woke back up and finished strong. The last bit of the course has you doing a lap around the high school track. It is the best part. You can see the end. How fast can you run the loop? 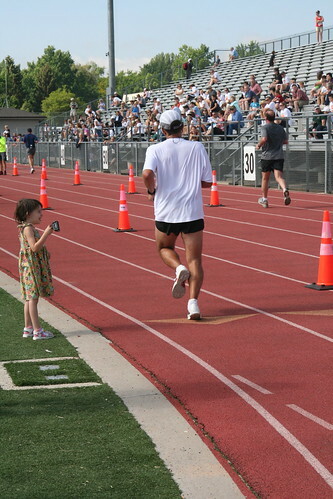 Kim had a camera malfunction but caught me going by with one of my 2 biggest fans standing track-side ringing the bell. I had watched my spilts the whole time and had no idea what my finish time would be. When I looked up and saw it ticking towards 45 I was pissed. That was a hard race. That was the best I could do? Crap. The McMillan Running Calculator had me at a 43:52 based on that 5k a month ago. With a better course and a taper, that was possible. So the good news is that I am in line for a 3:25 marathon based on those results. I am 10+ pounds heavy and haven’t gotten through the big summer running yet. So while, I don’t see myself breaking 40 in the 10k anytime soon (or ever). I see the 3:15 marathon coming into reach with each performance. Still more work to do though. Post-race, we had Simon and family back to our house for a dip in the “ice bath” — I mean pool — for a cool down. Had a great brunch and let the kids all hang out and play. Nice relaxing way to finish up a race morning.